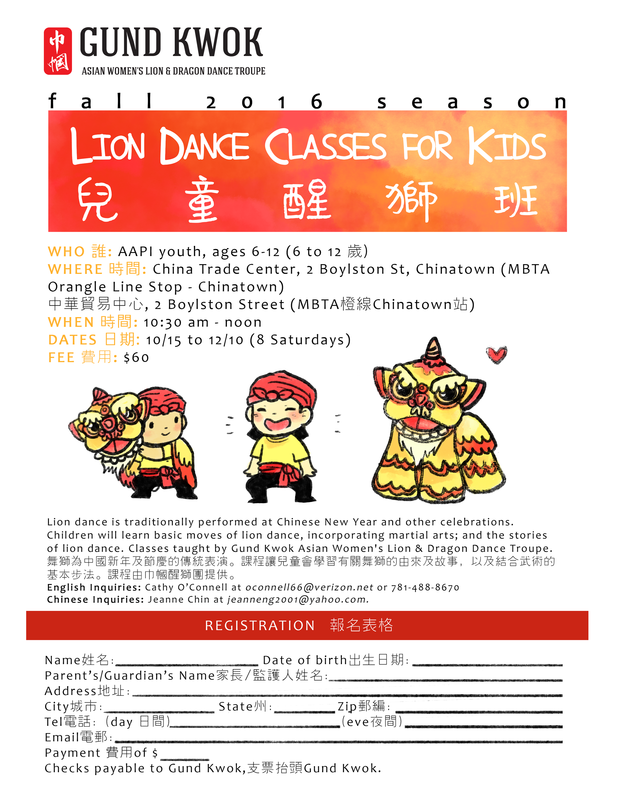 Lion Dance Classes for Kids Start Oct 15! Classes start Saturday, Oct 15th from 10:30AM to 12PM for 8 Saturdays at the China Trade Center in Boston, MA. Open to AAPI youth ages 6-12. Fee is $60. Fill out the form below to register! 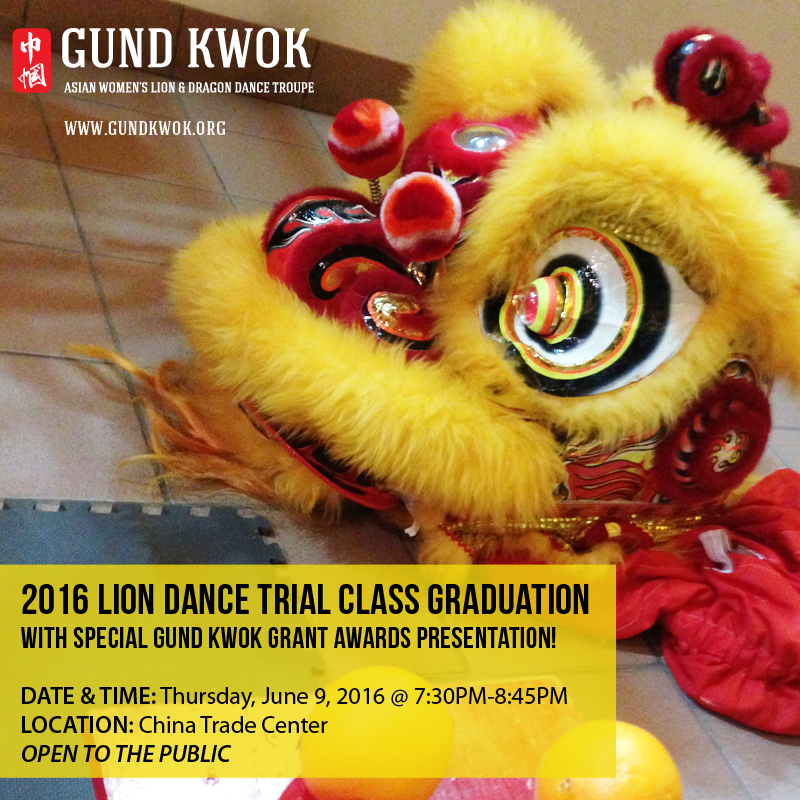 On Thursday, June 9th, the 2016 GK 10-Week Lion Dance Trial Class students will be performing as part of their graduation to showcase what they’ve learned. Also, there will be a grant awards presentation to an organization that GK has selected that furthers and empowers Asian American women. Come join us from 7:30pm-8:45pm at the China Trade Center — the event is free and open to the public! Learn Chinese Lion Dance! 10-Week Trial Class Starts THU, Mar 31st! 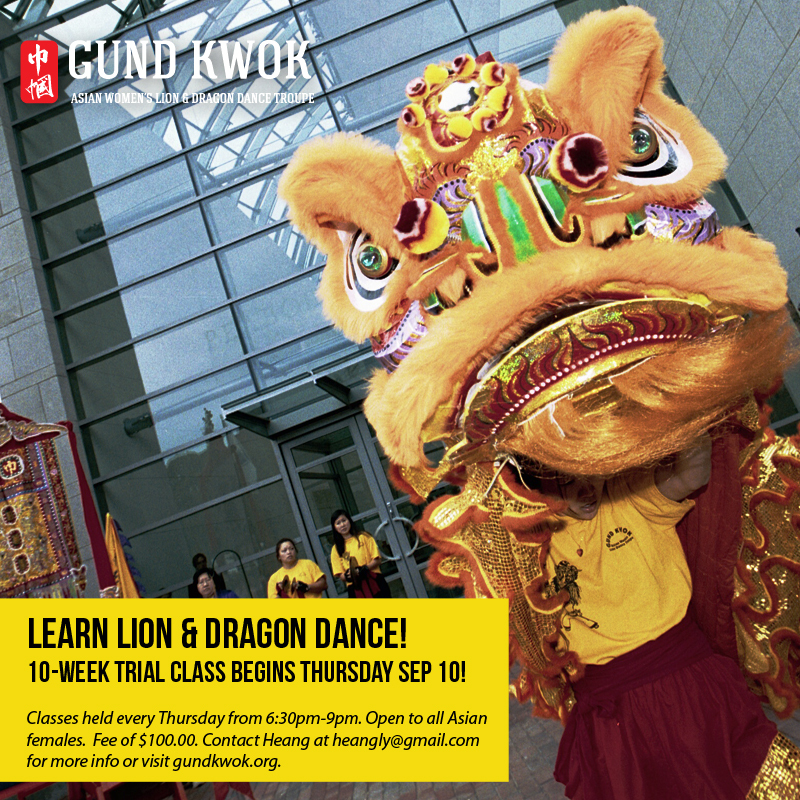 Gund Kwok Asian Women’s Lion & Dragon Dance Troupe is offering a 10-Week Lion Dance Trial Class, which includes a free Dragon Dance Trial class, is available for only $100 with an opportunity to join our troupe upon graduation. All skill levels are welcome and accepted! Each class will begin with exercise to condition and build stamina. The rest of class time will be devoted to learning different skills and moves for the lion. 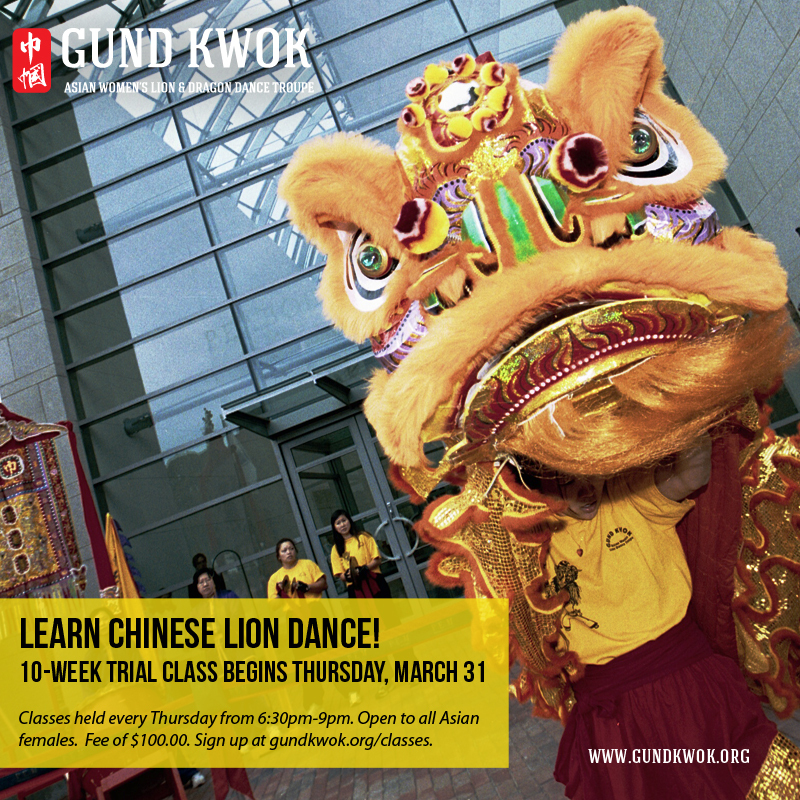 During the 10th week, you will “graduate” from the Gund Kwok trial program by performing a lion dance with your classmates for your friends and family! If interested, please fill out the form below — check off the box for “10-Week Lion Dance Trial Class”. We can’t wait to see you there! 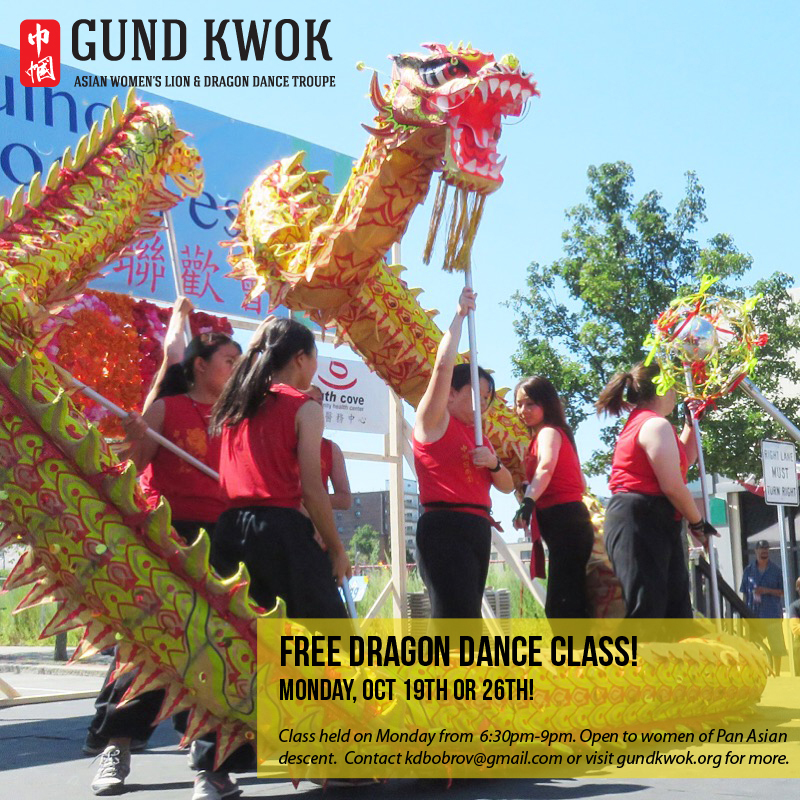 FREE Dragon Dance Class in October! If you’re an Asian female, come join us for a trial class. It’s fun and FREE! Classes are located on the lower level of the China Trade Center in Boston Chinatown. Bring workout clothes, sneakers, and a water bottle. For more information, contact kdbobrov@gmail.com. Learn Lion & Dragon Dance! Classes start SEP 10th! Content: Each class will begin with exercise to condition and build stamina. The rest of class time will be devoted to learning different skills and moves for the lion. Note: Your trial class will be taught by many different GK Lion troupe members and occur during GK’s regular lion practice time. This means you get to meet and learn from all the wonderful GK lion dancers! 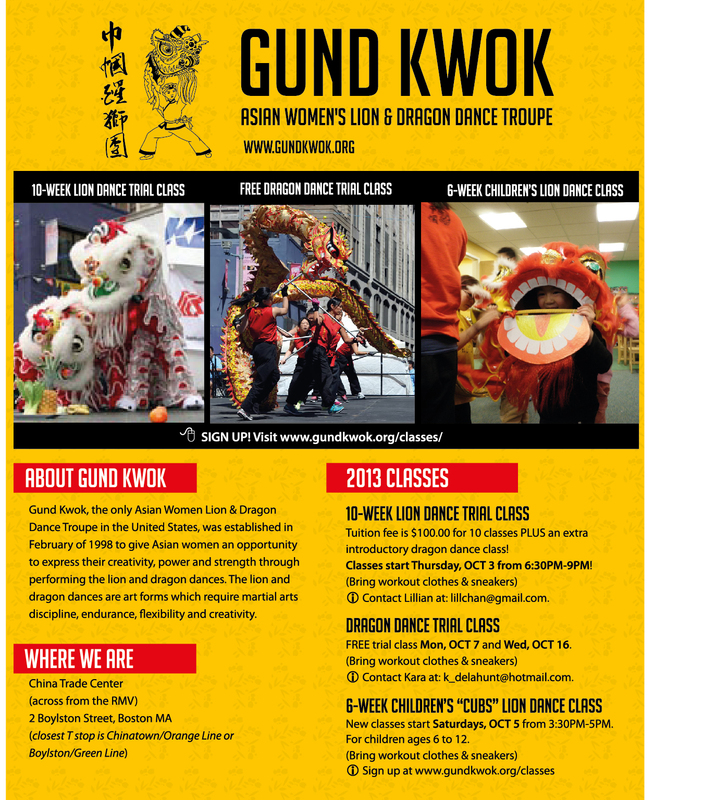 2014 Gund Kwok Lion and Dragon Trial Classes! We hope you are having an extraordinary summer! We are excited to inform you that the Gund Kwok troupe, the only all-Asian female troupe, will be providing lion and dragon dance classes after Labor Day. Come learn a centuries-old tradition while getting your workout on with a wonderful group of diverse Asian women! The key details are listed below. Please feel free to share this with your Asian female friends and colleagues who may be interested. If interested, please fill out the form below by end of day Fri., 9/5 as to whether or not you will be participating in our trial classes — please check off the box for “10-Week Lion Dance Trial Class”. We can’t wait to see you there! Watch this video to learn how to do the “Seven Stars” step of the lion dance. GK Lion Dance Trial Class student, Jenn, in her first lion dance performance! Congratulations to our lion dance trial class student, Jenn! She completed the 10-week class with a graduation routine — well done! 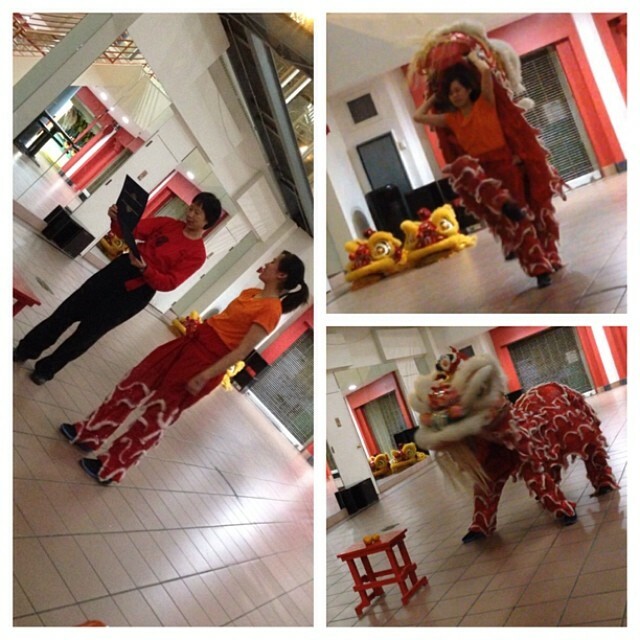 If you’re a fellow Asian woman interested in learning the art of lion dance, let us know! Classes are ongoing so SIGN-UP below! 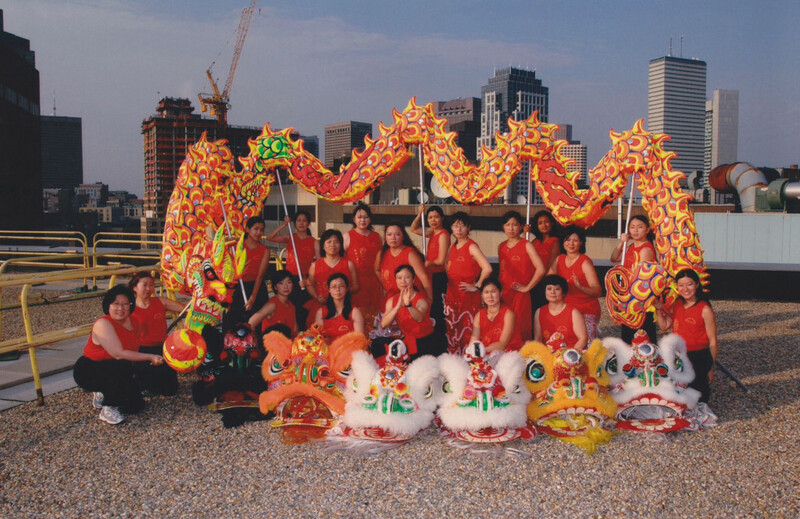 The Gund Kwok Asian Women’s Lion & Dragon Dance Troupe is hosting a FREE trial class for Asian women in the Greater Boston area. Where have I seen your troupe before? Many places! Here’s a short list: Chinatown Lunar New Year Celebration, Quincy Lunar New Year Celebration, BU’s Origins Culture Show, and on TV and in movies: The Departed! Gund Kwok, which means heroine in Chinese, symbolizes women’s power and strength. We are a team of dynamic Asian American women of all ages, professional backgrounds, and personalities! Check out the unique GK experience on NPR! The dragon dance is a highlight of Chinese New Year and other major celebrations held worldwide in Chinatowns around the world. Check out our moves! What is a trial class? A trial class is open to all Asian American women of all ages and is an opportunity to try Dragon Dance. You will be given an introduction of Dragon Dance, followed by a warm up, and then off to get under the dragon! GK 2013 Lion and Dragon Classes! Dragon Dance Trial Classes in April! Experience the art & power of dragon dance! If you’re an Asian female, come join us for a trial class. It’s fun and FREE!